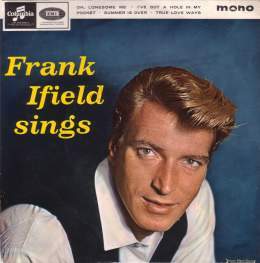 Despite the fact that most people in the UK regarded him as an Australian, Frank Ifield had been born in England. His parents had emigrated when he was very young, but Frank decided to return to the old country after already establishing himself as an entertainer in Australia. As far as singers were concerned it was the UK that was the land of new opportunity. Shortly after his establishment in England, Frank secured himself a recording contract with Columbia under the guidance of Norrie Paramor. Frank's first release 'Lucky Devil' reached the #22 spot, but 1961 must have been a worrying time for Frank because he scored a complete blank and he was fortunate that Columbia didn't call a halt to proceedings. However in the summer of 1962 the song 'I Remember You' suited Frank's yodelling style absolutely and its catchy melody was soon being whistled by the British public throughout the land. It became an enormous smash hit and two more consecutive #1s followed to make it three in a row. The EP shown on the right (SEG8377) was released in 1964 and was one of no less than six released on that format alone. Indeed, Frank was close to his peak of popularity and James Wynn's notes on the back of the sleeve leave us in no doubt of that. However, the days of Frank's remarkable run of top ten successes were already behind him. Despite the fact that many reviewers wrongly claim that he was finished when the Beatles arrived, most of his singles made an appearance in the chart until 1967 after which he never returned. Since when, like many popular performers of the era, he has successfully made a career in cabaret and the 1960s nostalgia scene. Columbia SEG8277 1963 "Confessin'" w.Norrie Paramour Orch. Columbia SEG8284 1963 "Lucky Devil" w. Ken Jones Orch. Columbia SEG8322 1964 "Born Free" w.Norrie Paramour Orch. Columbia SEG8359 1964 "I Should Care"
Columbia SEG8377 1964 "Frank Ifield Sings"
Columbia SEG8385 1965 "Funny How Time Slips Away"
Columbia SEG8448 1965 "Love Walked In"
Columbia SEG8456 1965 "Hong Kong Blues"
Columbia SEG8495 1966 "Give Him My Regards"